On 5 February 2014, the International workshop “Urban food strategy mix” welcomes cities and interested parties engaging in strategies for low-carbon and resource-efficient urban food systems to exchange actively on initiatives in “growing” (production), “delivering” (supply) and “enjoying” (demand). A joint reflection on how cities might move beyond an inventory or wish list of inspiring actions to a strategy that creates synergies, increases resilience and generates a vision of a coherent local food system. 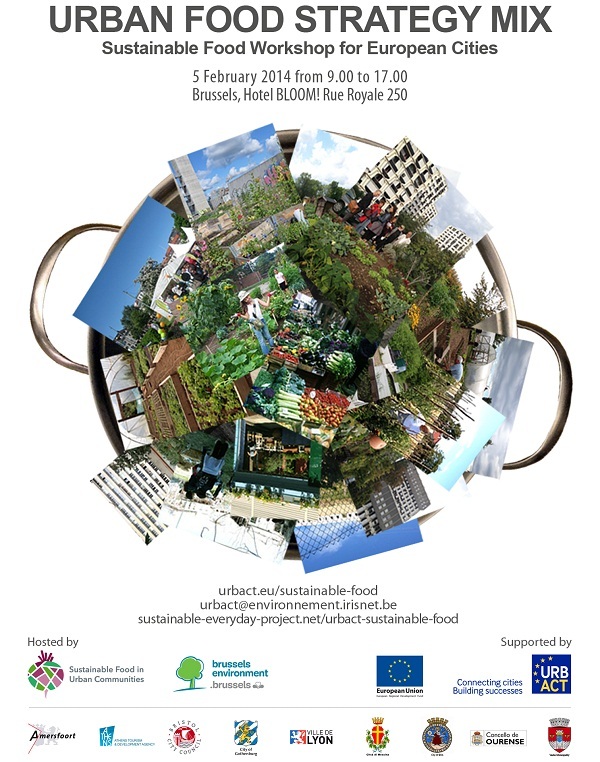 Hosted by Brussels Environment, the event marks the half-way point of the Sustainable Food in Urban Communities Network, a European project co-financed by the ERDF through the URBACT II programme. It will bring together knowledge and experience from participants outside the network and of the 10 partner cities: Brussels Capital Region (BE), Amersfoort (NL), Athens (GR), Bristol (UK), Gothenburg (SE), Lyon (FR), Messina (IT), Oslo (NO), Ourense (ES), and Vaslui (RO). Held in English only, the workshop is free, but open to a limited number of participants. 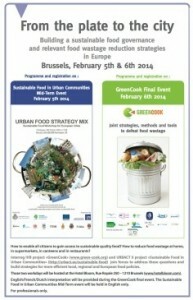 The following day, on 6 February 2014, Brussels will also host the closing conference of the GreenCook project (InterregIVB) which tackles food waste prevention by households, supermarkets, restaurants and canteens. The GreenCook conference will take place in the same venue in English, French and Dutch. This event requires separate registration.